I had always wondered who lived at the intersection of two beautiful Atlanta residential streets. On the lawn was a stone well house with a wooden shingle roof. The estate-like landscape included many flowering shrubs and trees artfully placed around an expansive lawn that came down to the street. When I first started writing for the Atlanta Journal & Constitution, a friend of mine told me about her mother's courtyard at a condominium complex and offered to take me there. I was enchanted the moment I walked through the gate into a 20 x 20 foot patio surrounded by a high brick wall. There was so much to see in this very small space. It was beautifully composed, mostly with containers, but with other vines and shrubs planted in the ground. "Where did you get such a variety of plants?" I asked, intrigued that she had such an interesting mix of things like native wildflowers, climbing roses, Japanese roof iris and hosta. On the wall to the right as you entered was the dwarf, small-leaf version of Boston ivy ('Lowii'), perfect for the space. Going up the iron railing on one side of the steps to the front door was a lovely Clematis texensis hybrid, 'Duchess of Albany', with pink bells. On the other side was the native crossvine, Bignonia capreolata, with its yellow and burgundy red flowers. An odd combination, but it worked. 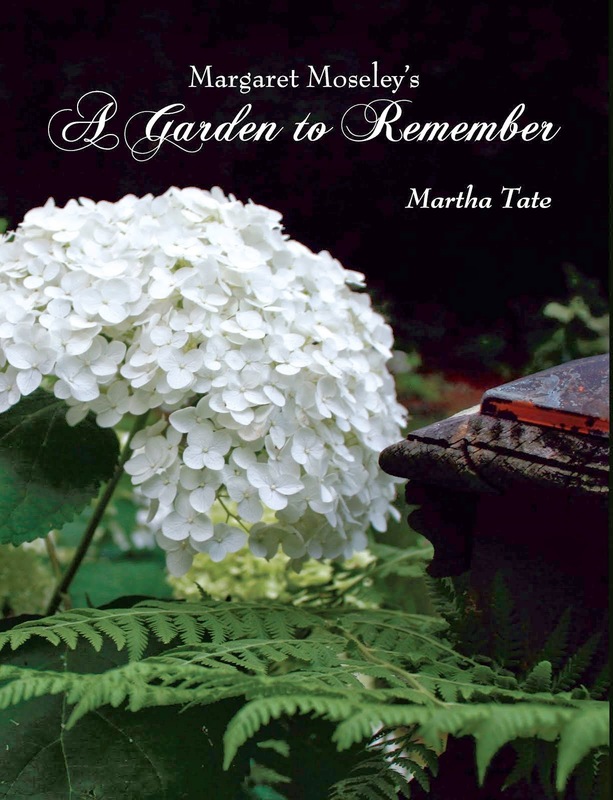 For color, my friend's mother, who I later found out was a well-known gardener, would go to grocery stores and buy hanging basket of petunias and other flowers and plop them into beautiful urns. "I buy a lot of hanging baskets and put them into containers," she explained. "It gives you an instant effect for very little trouble." 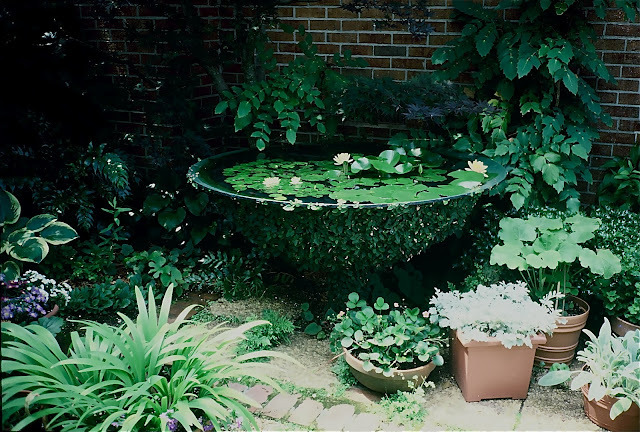 In the photograph above is a fig vine-covered basin filled with water lilies. "I brought these from my home, along with the native plants. I loved the crossvine, and if you ride by there you can still see it in the trees." I asked where to go, and then she told me. She had been the owner of the house and grounds I had admired so. She and her husband had downsized to a condominium. "I tried to bring a few things that I loved," she said. It was truly one of the most charming small gardens I had ever seen. She had rosemary topiaries and some herbs, and roses and large-flowering clematis climbing up the walls. The space was small, but she had transformed it into a garden where she could still enjoy working with plants and have a taste of home. Even if the space was not so grand, she had managed to capture a feeling of elegance - aided, amazingly enough, by hanging baskets from the local Kroger.